The BDL conduction cooled fiber coupled diode lasers are available in various sizes from 5W to 400W. The integrated optical design, accurate test and selection of high quality semiconductor materials and efficient thermal management make these devices the ideal choice for applications requiring reliability, long lifetime and simple conductive cooling in a small footprint. BDL packages are coupled to standard SMA patch cables. Custom pig-tailing or free space collimated output are also available. 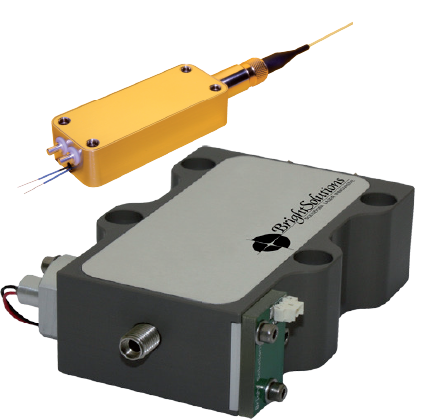 The BFP high power fiber coupled diode lasers are available in different sizes from few Watts to 400W of CW power. Pulsed models feature up to 2000W of peak power. Based on an integrated multi-single emitter design, they are particularly suited for pumping applications, ensuring very long lifetime, low current operation and the highest brightness in a miniaturized package. BFP packages can be coupled to standard optical connectors like SMA, FC, ST, and can include a variety of accessories from aiming beam to integrated controllers, aimed to medical, industrial, scientific and aerospace direct applications. Customized Mil spec models can be designed, manufactured and qualified. Multi-wavelength solutions (MDL) are well suited for a variety of medical applications; up to 4 different wavelengths can be available in one module. Models with free-space collimated or line-shaped output are also available.